Preface--- Hank the Cowdog hails from a ranch near Perryton, right here in the Texas Panhandle. His creator, John R. Erickson, has been producing Hank stories for decades. But, if you are not familiar with Hank the Cowdog, just understand that in the words of Mr. Erickson, himself, Hank has a few quirks. He doesn’t always know as much as he thinks he does, he can be a smart aleck, and he can easily go off on a tangent that has nothing to do with anything. Most importantly, Hank thinks like a dog. Well, he is a dog. So, hang on, and learn a little about Texas Panhandle wildlife from the local legend, Hank the Cowdog. My boys were all in their teen-aged years and the family was motoring down the highway to who knows where. No-one was asleep and no-one asked, “When are we going to get there?” Instead, we were tuned into a Hank the Cowdog audio cassette that was playing over the speakers. No telling what kind of trouble or adventure Hank was getting himself into this particular episode. He might have been barking up the morning sun, thus aggravating the rancher’s wife, Sally May, or he might have been laying in the shade, dreaming about a lady friend. In that latter case, you can bet that he had the sleepy pup, Drover, keeping watch over the farmyard. Regardless, you can bet there was laughter in our vehicle, and the most uncontrollable laughter may have been from me, the oldest person present. 4. If you love the Texas Panhandle, and everything for which it stands. Many a trip was spent listening to Hank cassettes. It didn’t matter what age we were, ole Hank’s tales were interesting and kept us laughing. In fact, to this day if we ever drive through Perryton, there was no driving past Waterhole # 83, a convenience store made famous by Hank because it was a stopping point for Hank whenever he rode into town with his humans. Hank: It’s me again, Hank the Cowdog. Hello. Welcome, Hank. Have you ever met or had interactions with a wildlife biologist before me? Hank: Yes. I bit one several years ago, caught him sneaking around on my ranch without permission. He was wearing some kind of silly little uniform and he was…I never figured out what he was doing, counting birds or something. I slipped up behind him, and we’re talking about Stealthy Crouch Mode, and launched a Fang Missile at his you-know-what. Heh. Boy, that woke him up. Hank: No. Hurry up, I’m a very busy dog. Sorry. What is your favorite wildlife species here in the Panhandle and why? Hank: Her name is Missy and she’s a coyote princess. She comes from a family of cannibals and they live in those deep canyons north of headquarters. Now and then, when I grow weary of all the work and responsibility of running this ranch, I have fantasies about quitting my job, joining up with the coyotes, becoming a cannibal, and marrying Missy Coyote. Actually, I tried that once and it didn’t work out. Her kinfolks were cannibals, right? Terrible manners. Also, I didn’t like the way they stared at me with those yellow eyes, licking their chops. I had supper with them and it wasn’t me, thank goodness. Around sundown, her brother dragged up a dead sheep. That was the main course. They called it Aged Mutton. Wow, you talk about indigestion! The smartest critter on your ranch? Hank: This is a little embarrassing, but what can I say? The answer is as obvious as the nose on your hand. ME. That’s why they made me Head of Ranch Security. Hank: No contest. Sally May’s rotten, pampered little crook of a cat, Pete. He holds the World Record for catching mice—none. He spends his days lurking and lounging in the iris patch, scheming ways of getting me into trouble with the Lady of the House. That’s okay, let him scheme. He’s no match for the Head of Ranch Security. I’ve got the little sneak exactly where he wants me. Which eats more cats – coyotes or great horned owls? Hank: I don’t know, but they don’t eat enough. SUPPORT YOUR LOCAL OWL! Have you ever tangled with a bobcat? Hank: I have, yes. His name was Sinister and it was one of the shortest fights of my whole career. I caught him in the feed barn, see, turning over bales of hay and looking for mice, only I thought he was Pete, our slacker of a cat. He wasn’t Pete, and he wasn’t amused when I landed on top of him. What critter that lives here in the Panhandle do you least like to run into? Do you have an experience that you want to share? Hank: Sally May, Our Beloved Ranch Wife. She’s a fine lady, but she has peculiar ways. Here, look at this list. 1. She has Radar For Naughty Thoughts. Dogs and little boys have no chance of getting by with anything. I mean, the woman sees everything. 2. She likes cats, especially Mister Never Sweat. 3. When I lick her on the ankles, she screeches at me. 4. She doesn’t allow dogs in her yard, which is outrageous. UnAmerican. 5. When she catches me in her yard, she goes for The Dreaded Broom, and she knows how to swing it. Ouch. I long to be the Dog of Her Dreams, and I keep trying to patch up our relationship, but nothing seems to work. Hey, I put in eighteen hours a day, trying to protect her chickens slurp from the Bad Guys. Hank: Please disregard that. I was misquoted. Where were we? Your broken relationship with Sally May. Hank: Oh yes. I bathe almost every day in the overflow of the septic tank, but still she complains about my “odor.” What does a dog have to do to please these women? I don’t get it. A skunk’s defense mechanism – over-rated? Hank: In my line of work, Enemy Identification is very important. If he’s got beady little eyes, a long bushy tail, and black-and-white strips on his back, don’t jump him. Repeat: DO NOT JUMP HIM. The funny thing is…well, we keep jumping them. I do. Drover is such a chicken, he wouldn’t even jump a grasshopper, but somehow I can’t resist jumping on top of something that moves slower than grandma and doesn’t fight back. Hank, were you raised on that ranch? Born and raised in the Panhandle? 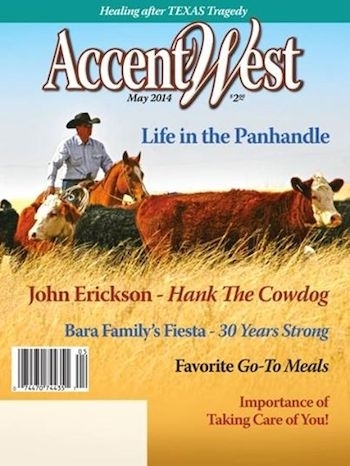 Hank: Yes, I was born in the Panhandle town of Twitchell, and I’m proud to report that my nursery was a cardboard beef box—not a box for grapefruit or Brussels sprouts, but a box that still held the aroma of BEEF. I left my happy home in town because…well, Ma got really crabby, nursing nine pups that were as big as she was, and she urged us, you might say, to go find a job. The owners of this ranch were scouting for a new Head of Ranch Security, and I was their First Round Draft Choice. Is that impressive or what? You bet. The scariest place in the Panhandle that you have been in? Hank: Inside Sally May’s house. Alfred, her son, took the screen off his bedroom window, don’t you see, and lured me inside with a piece of raw bacon. I knew it was a bad idea, but taking care of the kids is part of my job, right? We ate a box of Graham crackers in bed and played Shadows on the Wall. We had a blast, but maybe I shouldn’t have barked at the shadows. Guess who heard my bark. She hears everything, nobody’s safe when she’s around. Critter that you have run into, that a human would never believe you saw here? Hank: A full-grown Silver Monster Bird. Last spring, I caught one flying over the ranch, scariest thing I’d ever seen. Description: Huge. Sharp nose and cruel eyes. Made a terrible roaring sound and smoke came out from beneath his wings, which didn’t flap. No ordinary dog would have stood there, firing off bark after bark, but I did and he left. Oh, he had a star insignia on each wing and some kind of coded message on the side: “USAF.” We haven’t broken the code yet, but we’re working on it. If he ever shows up again, he’ll get the same treatment. No mercy. Hank the Cowdog does not take trash off the cats…or off the Silver Monster Birds. Hank, kids in the Panhandle think you’re pretty awesome. Hank: Listen to the little children and go read my books. This case is closed. So, after Hank and I exchanged goodbyes I turned and headed towards my vehicle. I briefly looked back, remembering Hank’s first answer that told of him biting a biologist, and I remembered the time the blue healer broke skin on the back of my calf as I opened the door to climb into my government vehicle on a ranch over by Lefors. Hank just set there smiling. I’m not sure how much about Panhandle wildlife we learned but, wow, that was interesting, and that was vintage Hank. The adventures of Hank the Cowdog are definitely worth keeping up with.